This article focuses on the reflective tapes and sheeting used for various applications within work zones or temporary traffic control zones. A “Work Zone” is defined as an area of a traffic-way where construction, maintenance, or utility work activities are identified by warning signs, signals, indicators, and transport devices that mark the beginning and end of the work zone. A work zone extends from the first warning sign, signal, or flashing lights to the END ROAD WORK sign or the last traffic control device applicable to that work activity. 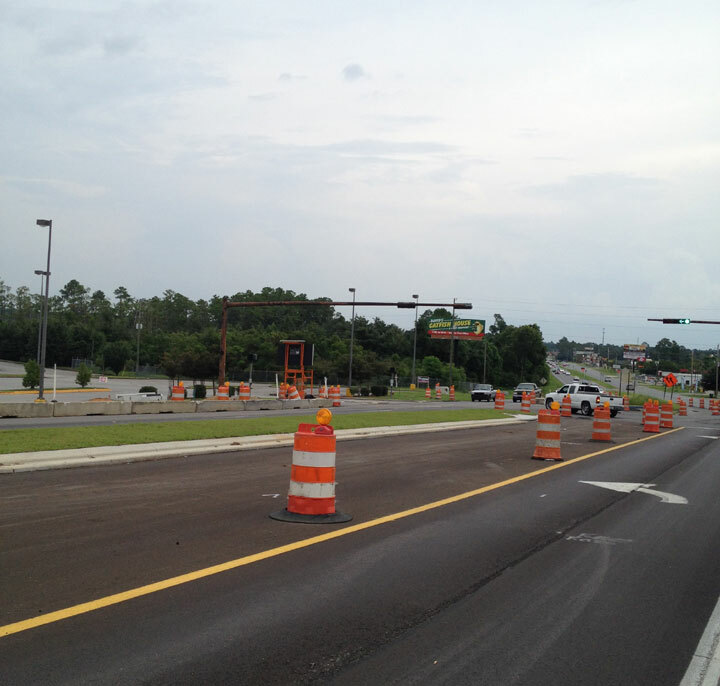 Work zones can also include roadway sections where there is ongoing, moving, work activity such as lane line painting. Signs to designate the beginning and end of the work zone. Orange and White Road Barrels. Arrow signs to designate lane shifting. In addition to the devices above, work zones or traffic control zones also contain workers and work vehicles. Flexible High Intensity Tape for Barrels and Delineators (4″& 6″)- flexible high intensity tape is a specially made product that is able to withstand an impact and bounce back to its original shape. (ASTM D4956 Type III) This makes it ideal for applications like road barrels or delineators. This material is available for barrels in 4″ and 6″ widths and in white, yellow or orange. Keeping fresh tape on the barrels will insure that they remain compliant with regulations. The MUTCD manual as well as your State DOT can give you more insight as to how to mark your particular barrels properly. Because this material is very bright and very conformable it is great for a variety of other applications where intensity and flexibility are crucial. Reflective Traffic Cone Collars are cut from the same material that we mentioned above (flexible high intensity – D4956 Type 3). Traffic Cones undergo even more punishment than barrels in work zones which is why a reboundable tape needs to be used. 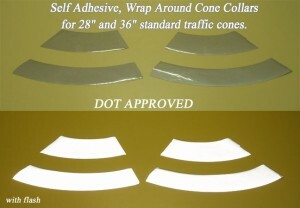 Traffic cone collars are cut with a curve in them so that when you wrap them around a cone they come out straight. To apply the collars you simply position the strip on the cone with the backing on it, tape one end with masking tape to create a hinge, begin peeling the backing off starting at the hinge and wrap the collar around the cone. The hinge insures a straight application. 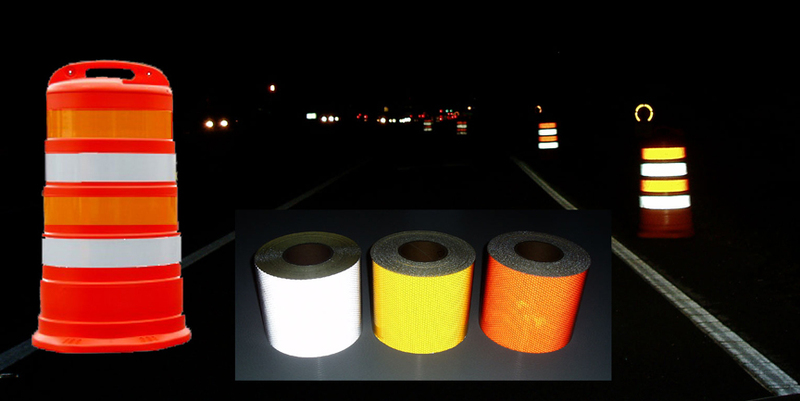 Pre-Striped Reflective Barricade Tape (engineer and high intensity grades) – reflective barricade tape is used to call attention to a work zone area and to designate which way traffic should go to get around the area. 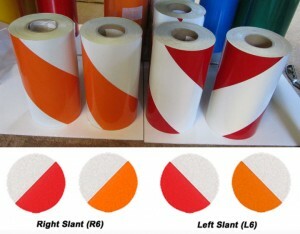 Orange and White striped tape is used for work zones while red and white designates dead end roads are areas where roads or bridges are washed out. Engineer grade is sufficient for certain areas whereas high intensity is required for others. Your inspector can let you know which intensity tape you need to use. A tape that slants downward to the right directs traffic to the right. A tape that slants downward to the left directs traffic to the left. 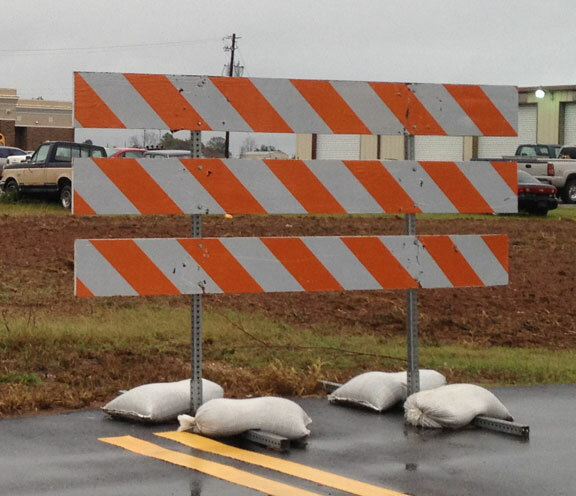 For certain barricades you would use a one slant on one side and the opposite on the other. A type one barricade like you see used over manholes is an example of this. Reflective Tape for Work Trucks – trucks that work within work zones need to be clearly marked so that they can be seen day and night. 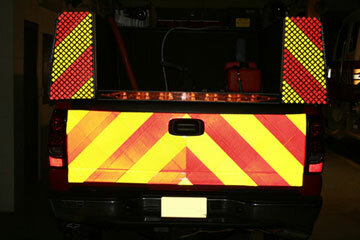 Red and White DOT reflective tape is required on tractor trailer type trucks. This regulation is applicable to all tractor trailers or semi trucks whether they are used in work zones or just on the road. Many of the trucks and equipment used in work zones do not fall under the federal regulation requiring DOT tape. However, due to the fact that they either move slow or are stopped around fast moving traffic, it is often more important to have them marked clearly so that they can be clearly seen day and night. A common pattern for fire apparatus is the chevron pattern pictured above. This pattern consists of alternating yellow and red striping that slants outward and downward at 45 degree angles. Since work zone vehicles do not fall under the same regulations that fire apparatus do they are often able to use different color combinations. The most popular material is our Reflexite V98 tape. It is prismatic and very bright and is also conformable which makes it a perfect choice for work vehicles. 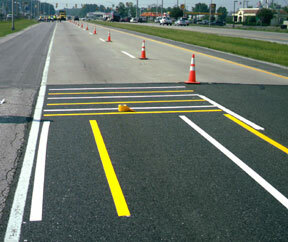 Temporary pavement marking tape is also used extensively in work zones to mark temporary traffic lanes. Lanes are required to be marked at all times so when a lane is temporarily diverted a new lane must be created. When work is complete, permanent lines can be put down. We carry a foil based tape that is designed to create temporary lines on pavement. It is easy to install and simple to remove. To install the tape you lay it on a clean, dry surface and press it in with a rubber tire to conform it to the surface. To remove the tape you can peel by hand or heat the tape with a torch. (the heat vaporizes the adhesive and removes the tape) The tape most often used for temporary stripes is our Wet Reflective or Premium Grade. It is much more reflective and continues to reflect well even in wet conditions. Raised Pavement Markers are reflective markers that are used on road ways to mark lanes and notify drivers when they drift over a line. At night, car headlights cause them to light up. When lanes are temporarily moved, new markers should be put down. For work zones the marker color will most likely be white or yellow and in some cases white/red or yellow/red. 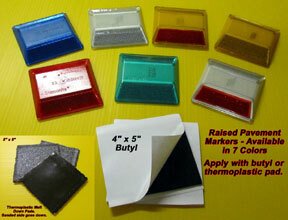 A butyl pad can be used for temporary applications. 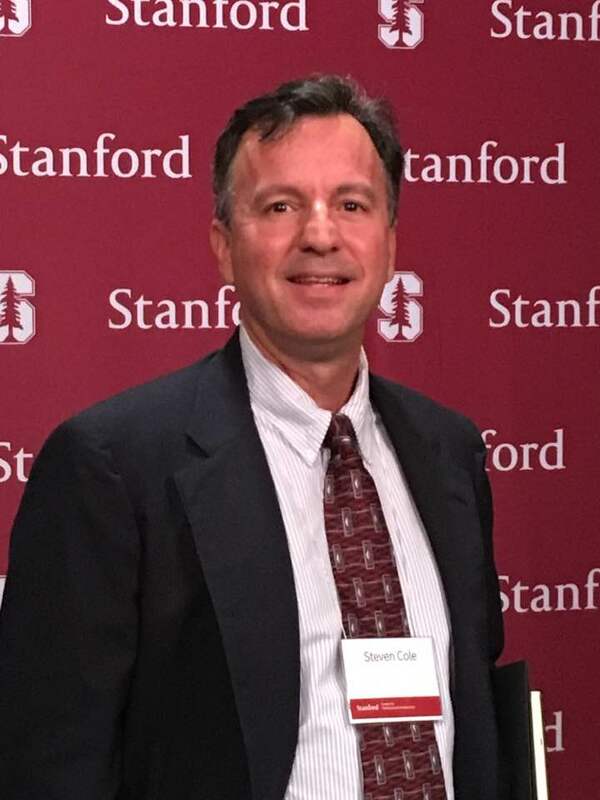 Steven Cole (Economics, MBA – University of West Florida , Business & Innovation – Stanford University) 22 years of experience in the reflective safety business. Specializing in accident reduction for vehicles through increased visibility.